Some say the world will end by fire. Others say by ice. Here in Alaska, the land of snow and ice, we’re beginning to feel the fire.In the summer of 2000 the Iñupiat community of Barrow – the farthest north settlement on the mainland of North America – had its first thunderstorm in history. Tuna were sighted in the Arctic Ocean. No one had ever seen them this far North before. The following winter Lake Illiamna on the Alaska Peninsula didn’t freeze over. No one, not even the oldest Native elders, could remember this happening. In Fairbanks for the first time in memory the temperature never dropped to 40 below. Months of unseasonably warm temperatures, scant snowfall and constantly-changing winds were followed by an early spring. This was not the exhilarating explosion, the sudden violence of the sub-Arctic spring. It was the slow attrition of dripping eaves and rotting snow. Once again this year, winter never really arrived. South Central Alaska experienced a violent storm with the highest winds ever registered there. The Iditarod dogsled race had to be moved hundreds of miles north because there was not enough snow. Here in Fairbanks, the mean temperature from September through February was the warmest on record. In November and again in February, we had freezing rain. At the small community of Salcha, the ice on the Tanana River broke free of the banks and jammed up, flooding nearby homes and roads. This is something that happens in April or May, not in the middle of winter. Researchers have been predicting for years that the effects of global climate change will appear first and most dramatically near the Poles. From 1971 through 2000, the annual mean temperature in Alaska rose by 2.69 degrees Fahrenheit. (On a global scale, an increase of this magnitude would be cataclysmic.) The volatile weather patterns of the past decade have been accompanied by other warning signs. Glaciers are melting at increasing rates. The sea ice is retreating, disrupting subsistence whale hunting and bringing storm waves that are eroding the land out from under coastal villages. 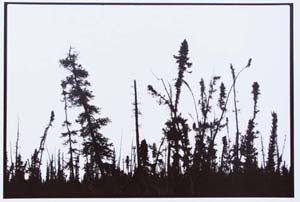 The spruce bark beetle is advancing north, the summer wildfire season is increasing in length and intensity, and the permafrost under the boreal forest is dissolving. Interior Alaska was once an inland ocean. It may become one again. The weather is sick. The northern jet stream has drifted south, and southern weather has drifted north. Our neighbors – the moose, the white spruce, the boreal owl, the paper birch and the snowshoe hare – know things we have long forgotten. Now it’s time for us to wake up from the dream we’ve been living, time to remember. In the North as in the South, we drive around in bigger and bigger vehicles on bigger and bigger highways, hoping that if we just keep moving fast enough it won’t all catch up with us. But it’s already here. The North has become the South. And as we’re chattering on our cell phones, retrieving our voicemail, zooming around town or running to catch our next flight somewhere, the polar ice is melting. In the presence of war, terrorism and looming environmental disaster, artists can no longer afford the facile games of post-modernist irony. We may choose to speak directly to world events or we may work at some distance removed from them. But whatever our subject, whatever our medium, artists must commit ourselves to the discipline of art with the depth of our being. To be worthy of a life’s devotion, art must be our best gift to a troubled world. Art must matter. We human animals have become an unprecedented force of nature. We’re literally changing the climate of the Earth, threatening the entire biosphere – that miraculous network of connections that sustains all life on this planet, including ourselves. Ecosystems all over the world are in imminent danger of losing their wholeness and diversity, their capacity to sustain themselves. With ever-expanding global commerce, the same is true for diverse human cultures. If we hope to survive we have no choice but to expand our awareness, to recognize our interdependence and our obligations to all human cultures and to all forms of life with which we share this beautiful stone spinning in space. Global warming is a disturbing manifestation of the inescapable truth that anything we do anywhere affects everything everywhere. If we choose to ignore this in our day to day lives, we may pay a terrible price on a planetary scale. The same is true for art and culture. Just as global climate change threatens the health of the biosphere, commercial mono-culture threatens the integrity of the cultural sphere, from Greenland to Australia, from Papua New Guinea to Siberia. Through the science of ecology, we’ve become increasingly aware of the rich diversity of species and ecosystems on the Earth. At the same time, with the advent of electronic media and instant communications, we’ve become increasingly aware of the rich diversity of human cultures on the Earth. We now understand that we need as many distinct plant and animal species as possible, living in whole, sustainable ecosystems. We also need the distinctive voices and visions of as many human cultures as possible. Artists use the tools of perception and imagination to evoke the sound, the light, the feeling of our times and places. Art embodies creative thought. Creative thought is a fundamental part of our participation in creation. It’s also essential to solving the problems of the world, from war and hunger, to extinction and global warming. Amid the daunting realities of our time, the work of artists may prove to be more important than ever. In the popular mythology Alaska is “the last frontier”. But global warming signals the end of the frontier. Now even at the ends of the earth, even in the most remote wilderness, no place on this planet remains untouched by the actions of human beings. Three decades ago I came to Alaska to “get away” from the world. But the world has followed me here in an inescapable way. I came here also to help save the wilderness. For years I worked as an environmental activist. When I left that work I did so feeling that someone else could carry it on, but that no one else could make my music. Implicit in this choice was my belief that, in a different way, music could matter as much as activism. In recent years as the signs of climate change have become undeniable and as September 11, 2001 has changed the world, I’ve felt with increased urgency my responsibility to live up to this belief. Today, as the horrors of war fill the news, I’m wondering again about the meaning of my life’s work. In my current work I’m searching for musical equivalents of pure color, combining instrumental music with auras of computer-processed sounds derived from the inner resonance of the instruments. But how can I spend my time on such esoteric things? How can I make art that doesn’t speak directly to world events? Then I remember Claude Monet. In 1914 the fabric of Western civilization seemed to be disintegrating. With the first World War raging, Monet was in his garden painting water lilies. His own son was in the war. The front advanced to within 35 miles of his home. Yet Monet continued to paint the reflections of clouds and willows in the waters of the pond at Giverny. To a friend Monet confided that he felt “ashamed of thinking about little researches into form and color while so many suffer and die”. Although he was old and in failing health, he might have found more immediate ways to express his feelings about the state of the world. Instead, while young men died in combat within the borders of his own country, Monet painted water lilies. And the world is richer for his doing so. Those expansive panels of water, flowers and mirrored sky were probably his greatest and most enduring gift to humanity. Politics is fast. By definition it is public. Art is slow. And it often begins in solitude. In order to give our best gifts to the world artists must sometimes leave the world behind, at least for a little while. It’s a brilliant April morning. Sunlight shimmers on the snow. Last night in calm valleys the temperature touched on 20 below. With a renewed sense of hope and purpose, I return to work in my studio. This essay is drawn from JLA’s book Winter Music.